As his search for clues takes him across the teeming city of Mumbai, from its grand high-rises to its sprawling slums and deep into its murky underworld, Chopra begins to suspect that there may a great deal more to both his last case and his new ward than he thought. I immediately wanted to know more about the drowned boy, and the baby elephant, and Inspector Chopra himself. And I enjoyed this detective story very much. I started to write "police procedural," though I suppose it doesn't really count as a police story when your detective retires in the first chapter. But Inspector Chopra ("Retd." as the text often points out) still draws on his contacts in the force, as well as his decades of experience as a police officer. It was interesting to compare the workings of the Mumbai police in this story with the British and American forces in other stories that I've read. I can't however think of another detective, private or police, who ends up with a baby elephant on his hands. It is a gift from Chopra's uncle Bansi, whom he hasn't seen in years. The elephant, soon named Ganesha after the Hindu god, arrives with only a mysterious letter saying, take care of him, because "this is no ordinary elephant." How someone with no experience, living in a high-rise apartment in a crowded city, is supposed to take care of him is left to Chopra to figure out, with a lot of help from his wife Poppy. She expected to have a retired husband around the place. Instead, she gets one who disappears for long stretches, leaving her with Ganesha and her own disapproving mother. The little elephant actually has a part to play in the investigation, which added an element almost of magic to what otherwise feels like a very realistic story. I had to remind myself that "this is no ordinary elephant." And in the end, who could resist a baby elephant with a taste for Cadbury chocolate? At one point I started googling pictures of small elephants at play, which made that day 100% better. I learned from Vaseem Khan's website that he works at University College London, in the Department of Security and Crime Science. I'm sure he drew on his experiences there in writing this story. It is an intriguing mystery, with a rather dark turn at the end, before its different threads wrap up neatly together. 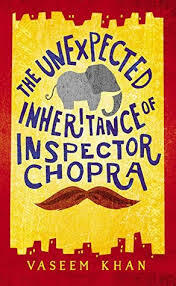 I also saw that Mr. Khan is working on a second book with Inspector Chopra and Ganesha, The Perplexing Theft of the Jewel in the Crown, and two more books are planned. I'm already looking forward to reading them. Aw, this sounds wonderful! And fun and sweet -- with a baby elephant no less! I am always on the lookout for genre fiction from nonwhite authors, so yayyyy, this is right in my wheelhouse. It is, Jenny! Though the author doesn't gloss over the darker sides of life in Mumbai, or the challenges that India is facing. This sounds like fun. Have you ever read Rosy is My Relative by Gerald Durrel? Adrian Rookwhistle is bequeathed an elephant and decides to take it to the coast to find a circus. Rosy, the elephant, is fond of strong drink which leads to all kinds of complications. It's laugh out loud funny, at least I thought so. I love his memoirs about his family, and his travel accounts, but I didn't realize he wrote fiction as well. I will have to look for that one, thanks! I am noting this Gerald Durrell book since he is brilliant and often funny. I had another round of baby elephant pictures today, Helen :) They just look so cute and funny! As much as I love police procedurals set in the UK it is always nice to find ones with a unique setting. I'm in a mystery mood right now and my library doesn't have this. It sounds like I need to have them purchase it! I MUST read this, a baby elephant, India and a retired detective. Thanks for telling me about it. A technically retired detective, Terra :) I hope you enjoy this as much as I did! The cover caught my eye on a GoodReads newsletter, and since India is becoming a current reading interest, I put this on my TBR list. Glad to hear you liked it--that makes it move up the list, for sure! >who could resist a baby elephant with a taste for Cadbury chocolate? This made me smile--I'm sure I will be Googling baby elephant pictures too. BTW, I fell in love with Bernini's elephant in Rome--for an absolute cutie pie, you should find that one! Apparently lots of people must search for Bernini's elephant, Jane, because it popped right up in Google! Lots of lovely shots - it's a beauty, all right. The book cover is definitely eye-catching, both with the colors and the design - it really stood out on the shelf. Murder by the Book is the best! I think they might have recommended another book in this series to me once? It was about a private detective in India and it had the same sort of feel you described with this book. Thank you all for your lovely comments and to you Lisa for the lovely review. I hope you don't mind me posting my appreciation here .. and yes, Jennifer, you are not the only one who thinks Rosy is My Relative is hilarious! Not at all - thank you for stopping by!